Guest review by John Swogger. For the full post, visit his blog. The Cage is (Rinko Endo’s) second complete comic work, and shares the same innovative approach as her Aggression Management Manga. Sub-titled “My Orthodontic Memoir”, it recounts her childhood diagnosis of malocclusion and the subsequent trials and tribulations of living with an orthodontic chin cap. I had a number of friends when I was a kid with various orthodontic retainers, braces and headgear. Beyond these, there’s a whole grim panoply of orthodontic appliances – power chains, coil springs, twin blocks, plates or retainers, facemasks, cervical headgear, headgear helmets, lip bumpers, palate expanders, elastics, bionaters, Herbst appliances, Wilson appliances, hybrid twinblocks, positioner retainers, face frames, face bows and jasper jumpers (thank you, Wikipedia for that exhaustive list) – none of which I’d ever heard of. A chin cap is another one of these devices that I’d never come across – having read The Cage, I’m glad. How can being clamped into a naugahyde, rubber and steel cage not feel like being captured by the Inquisition? Rinko’s story brings out all the physical discomfort, the skin irritation and the claustrophobia of her chin cap – but also the terrible confusion, humiliation and uncertainty that clouded all around her as she tried to figure out what it was all about. Was her chin cap some kind of obscure punishment? Even the inevitable name-calling and bullying at school was nothing compared to the ambivalence of the adult world. Rinko recounts her Mother’s disappointment, her Aunt’s judgement, her sister’s betrayal and her dentist’s disapproval to illustrate the immediacy of her own frustration and helplessness – and the gulf between that experience and the wider, more long-term concerns of her Mother. It’s a clever juxtaposition, and one that recalls some of the scenes in Aggression Management Manga. I love Rinko’s visual style. It’s the same cross-cultural mix – shōjo meets Family Circus, perhaps – that worked so well in Aggression Management Manga. She uses this mixture once again to excellent effect, effortlessly slipping in fantasy intercuts, snatches of dream-sequences and manga iconography that push the linear narrative. Her carefully-controlled line style and panel arrangements give her lively characterisations space to bounce around and come to life. Despite all the detail, there’s a certain openness to her panels that recalls colouring-books (I couldn’t resist with the cover – above) – adding a further stylistic reference to the mixture that again, works in the story’s favour. 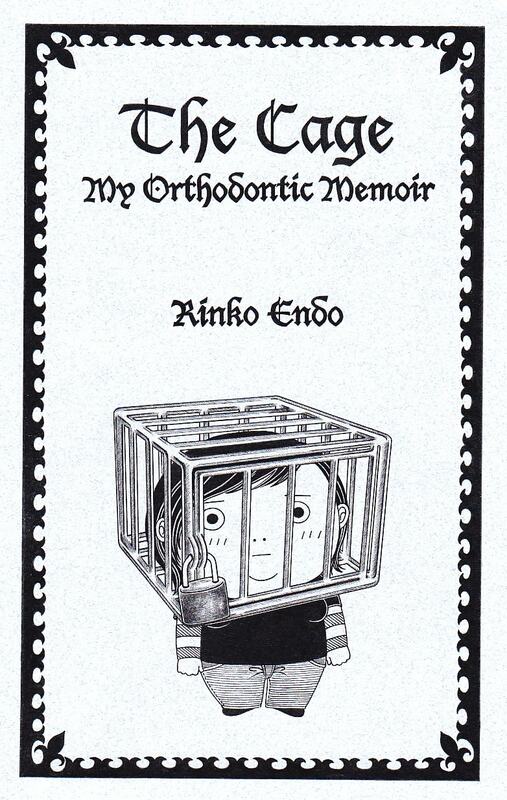 The Cage ends with a message, one that draws on Rinko’s experience as a psychiatric nurse. It’s an interesting conclusion to the story, wrapped up with a couple of distinctive panels that make excellent use of Rinko’s unique visual style. The cage of the visual simile becomes a personal and professional metaphor. Having to wear a chin cap is not like having cancer or dealing with depression – but Rinko makes it very clear that it’s no less a transformative experience. The Cage is a thoughtful comic that brings out an unexpectedly serious lesson from an apparently trivial childhood experience.